It was sometime just after 6:30 p.m. on Valentine’s Day 2000 when news broke of the most sensational piece of transfer news ever known at the Turf. For those of us tuned into the sports programme on Radio Lancashire it remains as dramatic now as it did then. 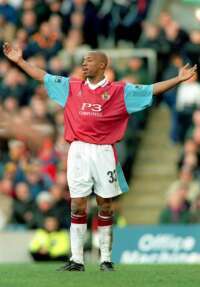 Suddenly Howard Booth broke off from an interview with Gordon Taylor to announce ‘BBC Radio Lancashire can tell you tonight that Burnley Football Club have signed Ian Wright the former England striker." He went on to say, "You may be aware that Andy Payton is suspended for three games from this coming Saturday against Wigan and you would have to say this is pretty decent cover." On the previous Saturday at Bournemouth I was just enjoying a pint when someone told me that we were signing him and I just laughed it off and didn’t even think it was worth a mention on a web site renowned for speculation. But it was true and suddenly our club was in the spotlight as just about everyone wanted to be part of it. The television cameras were there so quickly and there was never a lack of interview material as fans flocked down to buy tickets for forthcoming games. We’ve had great players at Burnley over the years but, and with no disrespect to any players in recent years, the club had been starved of success and top players. This was not just the signing of a top player though, this was the signing of one of the highest profile players in the game, a player whose personality matched his footballing ability. It didn’t just capture the imagination in fact it lifted the club sky high. Ticket sales were so dramatic that the club had to rush out and get hold of a ‘SOLD OUT’ sign as the next two home games against Wigan and Preston went in no time. Not only did we have one of the greatest strikers in England at the club but he was such an attraction that he was hardly costing us anything. The day of his debut was something else and Turf Moor hadn’t been so busy in years, some two hours before kick off it was pandemonium outside and there were even ticket touts around such was the demand. Fair enough, it died down and somewhat surprisingly Wright didn’t score in his first four games, in fact only Steve Davis (twice at Colchester) scored in these games and we failed to put the ball in the net in three consecutive home games. Wright was never to start a game again for the Clarets, he was carrying an ankle injury, but his contribution towards the promotion run can never be underestimated. He was used as a substitute, and a particularly effective substitute at that, and turned things round in a number of games. His first goal, at Gillingham, proved crucial and didn’t just earn us a point. Go back and take that goal away if you dare and suddenly it would move Gillingham into our place. But there were other games against Notts County, Oxford and Brentford in particular where his influence saw us win games that otherwise could have been drawn or even lost. Nobody will ever know where we would have finished in the league had we not signed him but I suspect we would have been looking at the play offs. He lifted the entire place both on and off the field and I’m sure made the other promotion hopefuls a little more nervous. He was without doubt the most exciting signing we have ever made, nothing has ever had such a dramatic effect on things as his arrival. He has a friendship with Stan, he is best mates with Mitchell Thomas and Barry Kilby and Ray Ingleby are believed to have been major players in completing the deal. Stan, Mitchell, Barry, Ray – whoever it was, I’m sure they all played a major part. This was without doubt the biggest signing ever by Burnley Football Club and one that will be talked about for years to come. 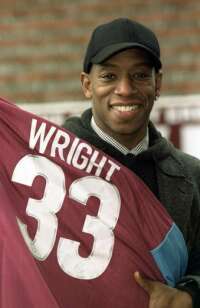 Even now I still find it difficult to believe those words from Howard Booth, I still find it difficult to believe that Ian Wright actually played for the Clarets. I can't think Stan could ever come up with something to better it. Mascots have once again become a part of football much as they did in the late 1960s when we had the likes of Beau Brummie at Birmingham and our very own Turfy Topper. I’m never so sure when Bertie Bee first buzzed his way out of the Bee Hole End as a rather laid back bee, he seems to have been around for ages, but he slimmed down in time for the Preston game in 2000 when he sorted out the obnoxious Deepdale Duck in a pre-match challenge. The work he had put in to get fit had paid off but it was to be another Preston game two years later when Bertie became known throughout the land as his antics were picked up on live television. Over the years there have been great times at the Turf and there have been some not so great times. There have been incidents to infuriate and incidents to bring a smile and a cheer. There have been occasions when something has brought laughter to the crowd but never anything like Bertie’s exploits in another game against Preston. 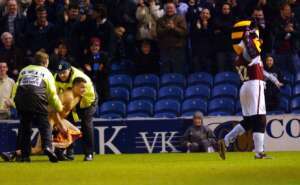 The Clarets were beating our Lancashire rivals 2-0 when for the first time I can recall we were visited by a streaker. He emerged from the Jimmy McIlroy Stand and made his way straight down the pitch towards the Preston fans. When he reached the penalty box at the Cricket Field End he turned away from the visiting fans and bent over to display his cheeks that were bearing the score 2-0. Nobody on the pitch did anything about it and the police and stewards seemed slow to react and so the streaker turned and set off back towards his seat. He wasn’t far off making it either when Bertie stepped in. Now we all know that Bertie used to be good friends with Ronnie Rhino at Leeds and is now a good mate of the Bradford Bull and it is obvious that these two have been teaching him some rugby tackles. Urged on by his local mate Bumble he buzzed onto the pitch and brought down the streaker with a tackle that any scrum half would have been proud of. The streaker was escorted from the ground, and subsequently banned for life, whilst Bertie did a lap of honour taking bows to the crowd as he went round. His fame has not gone unnoticed and he recently appeared on a charity quiz show on BBC in a round of ‘Feel the Sportsman’ where for a minute he found himself being touched up by Ally McCoist and John Parrott. The tackle on the streaker though has to be the funniest thing I have ever seen on a football ground.